We are only five rounds into the 2019 season, but already Newcastle faithful will be feeling like it’s Groundhog Day. Better things were expected this year. Many pundits picked the Knights to make the top eight. They still might, but two competition points from five matches, with four of those at home, means they have a long road back if they are to play in September. Nathan Brown is rightfully under a lot of pressure. The bulk of this is currently due to the underperformance of his team. However, have they really underperformed. or was their much-vaunted recruitment drive not that good after all? Soon after, Jarrod Mullen was suspended after a positive test for anabolic steroids. The Knights lurched to five wins for the year and a wooden spoon was inevitable. The backline is completely different. However, of the forward pack and bench, there are five Knights who played in 2017, with Lachlan Fitzgibbon, Mitchell Barnett and Josh King not named in Fox’s best 17 for that year. So while the backline is relatively new, the forward pack does have a sizeable link back to that wooden spoon. The largest buys in the forwards over the past two years have been David Klemmer, Aidan Guerra and Tim Glasby. Klemmer, at just 25, should be reaching his career peak and is clearly doing his job, averaging over 180 metres gained per game this year. Glasby was not a noted metre eater at the Storm, and while his defensive work has tightened the ruck slightly, his 75-metre average per game is not enough. Similarly, Guerra’s average metres are way down at 72 metres this year and he is sadly past his best. 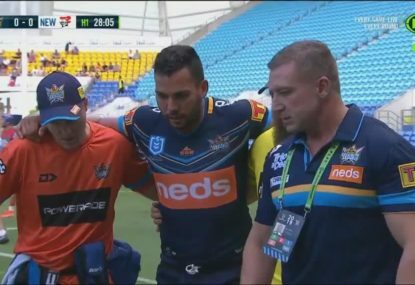 At the age of 31 and with his horrific ankle injury on Saturday night, there has to be a question mark surrounding his return to the game at all. The Knights are losing their matches through the forwards, a forward pack with far fewer personnel changes than the backs. 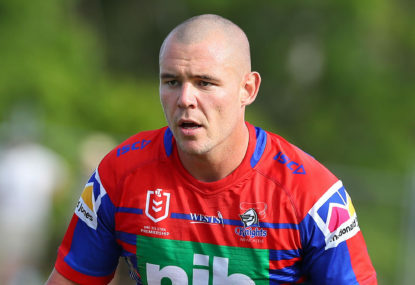 Other than their first-round win against a Cronulla team that were still reeling from a number of off-season disasters, the Knights have been beaten each week in terms of both metres gained and post-contact metres. These numbers are likely skewed towards Newcastle as well, with Kalyn Ponga running for around 200 metres in his last two games. While Pearce and Lino have borne the brunt of the criticism for the last two defeats, they are playing behind a beaten pack and as a result are looking rushed every time they get the ball. 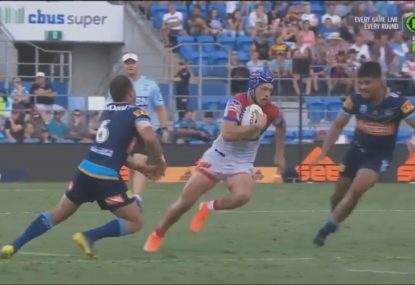 They are not getting enough opportunities to bring quality recruits Kalyn Ponga and Jesse Ramien into the game. 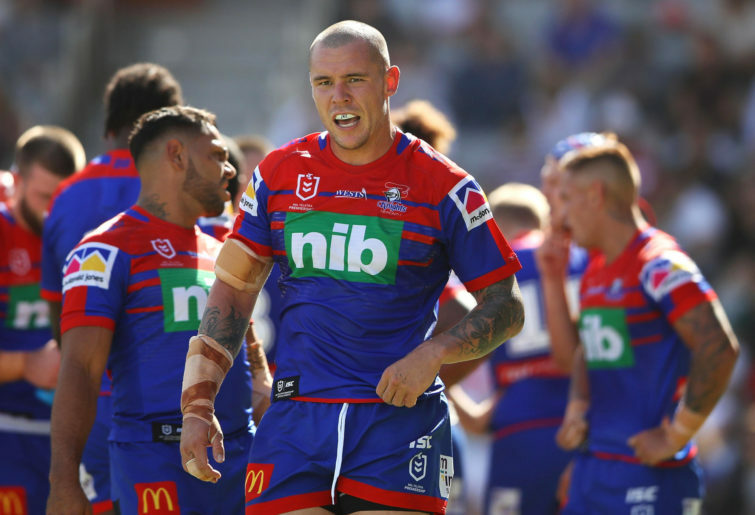 With the exception of Klemmer and arguably Lachlan Fitzgibbon, who is averaging 105 metres per game, no-one in that forward pack is doing enough in the go-forward statistics. That in itself is preventing its newly recruited backline from scoring enough points to win games. Perhaps Brown would have been best to spend a larger portion of the Knights’ cap on another one or two big-metre forwards. 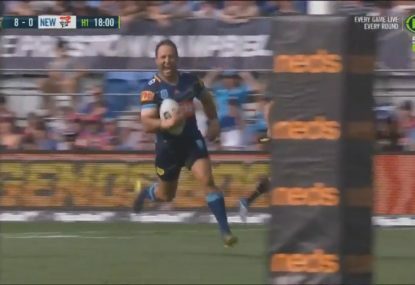 When Klemmer takes a break the Knights struggle for any real go-forward. Newcastle’s recruitment drive has no doubt been extensive, but that does not mean it has been as strong as many suggest. Until their forward pack starts to win the battle in the middle, their backline won’t be given enough time to shine. 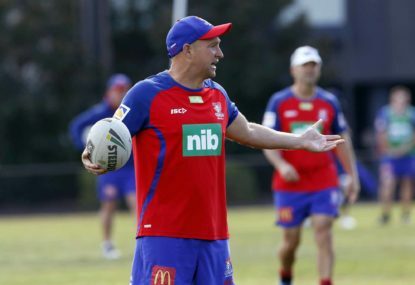 Nathan Brown is now under pressure as Knights coach. That pressure should be due to the quality of the recruitment drive rather than the results of the games themselves.